The world’s media has declared ‘chaos’ in Britain after Theresa May was humiliated in the Commons vote on her Brexit deal. 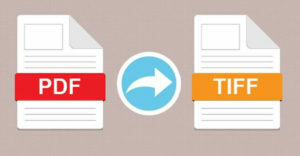 The PM’s withdrawal agreement went down by 432 votes to 202 in the House of Commons, the largest defeat on record for any government in modern times. The result has thrown Brexit into chaos and Mrs May’s government could be toppled in a confidence vote tomorrow. 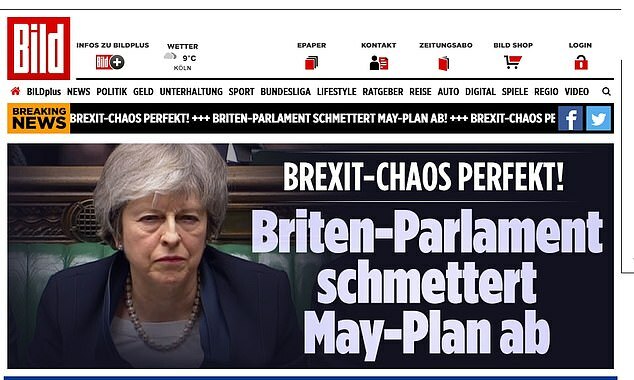 Germany’s leading tabloid newspaper Bild announced that the ‘Brexit chaos is complete’, saying MPs had ‘swatted May’s plans away’. The newspaper said a parliamentary ‘battle of nerves’ had ended with a ‘brutal hammering’ for the Prime Minister. Britain’s planned exit date of March 29 was ‘wobbling more than ever’ as a result of the vote, they wrote. Germany’s leading broadcaster ARD said Mrs May had suffered a ‘miserable failure’ but said Jeremy Corbyn would face pressure to back a second referendum if he did not win his no-confidence vote tomorrow. The country’s finance minister Olaf Scholz called it a ‘bitter day for Europe’, saying a no-deal exit was the ‘worst of all possibilities’. Meanwhile weekly magazine Der Spiegel said the Conservative leader had ‘failed with a crash’, saying Brexit was having a ‘collision with reality’. In France, financial newspaper Les Echos wrote that the Prime Minister had gone down to a ‘historic defeat’. Newspaper Le Monde said the result had ‘worsened the uncertainty over the future of the United Kingdom’. 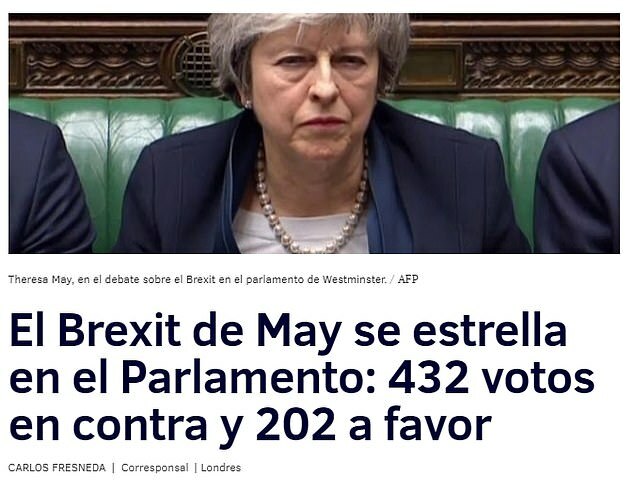 Spanish outlet El Mundo said May’s Brexit had ‘crashed in Parliament’ as a result of the massive defeat. 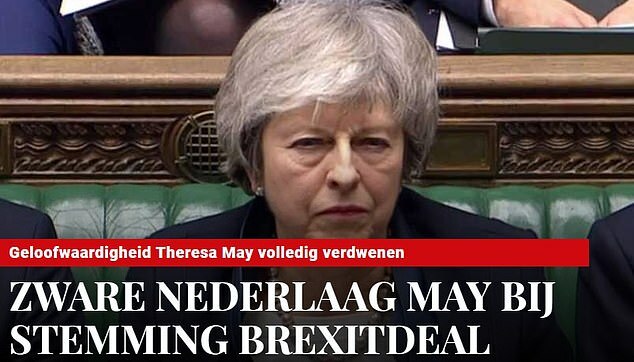 Dutch newspaper De Telegraaf announced a ‘heavy defeat for May in the Brexit deal vote’, saying that ‘faith in the PM has completely disapperaed’. 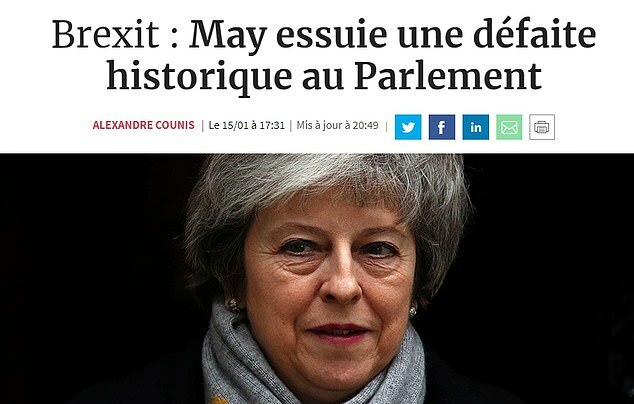 Dutch paper De Telegraaf said it was a ‘heavy defeat’ for Mrs May, pointing out that the last comparable Commons loss for a British PM was in 1924. Faith in Mrs May had ‘completely disappeared’ after the huge rebellion from inside her own party, the newspaper said. European Commission president Jean-Claude Juncker said: ‘I take note with regret of the outcome of the vote in the House of Commons this evening. ‘The risk of a disorderly withdrawal of the United Kingdom has increased with this evening’s vote. While we do not want this to happen, the European Commission will continue its contingency work to help ensure the EU is fully prepared.